Groups are an easy way of collaborating with students and teachers who are involved in a common activity. Every group should have a teacher supervising the group.Group members can discuss with each other about the agenda of the group through their School Loop account. To start a discussion, click the New button from the Discussion area of the Group’s homepage. All Group discussion threads appear in the Discussion area of each member’s portal. All members of the group may read and reply to any or all group discussion. For each post or reply to a group discussion, members receive an email. 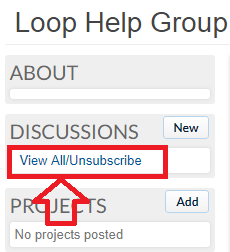 Click the View All button in the discussion area of the group homepage. Select Receive Replies by Email or Opt Out of Email Replies. Even if members opt out of email notification, they may still view and participate in all discussions from both their Portal Page and the Group homepage.